The Faraday cage at the Siemens high-voltage test bay in the Berlin switchgear plant measures 42 x 32 by 25 meters (137.8 x 105.0 x 82 ft). A team of electricians and engineers at the world’s largest switchgear production facility is researching lightning impulse voltages of up to three million volts. Built in 1958, the parabolic hall houses an impulse voltage generator the size of a house. And the Audi e–tron prototype is right on the middle of it. Flashes of light dance with a pulsating crackle over the car’s roof, lighting up the 25 meter (82.0 ft) high hall. 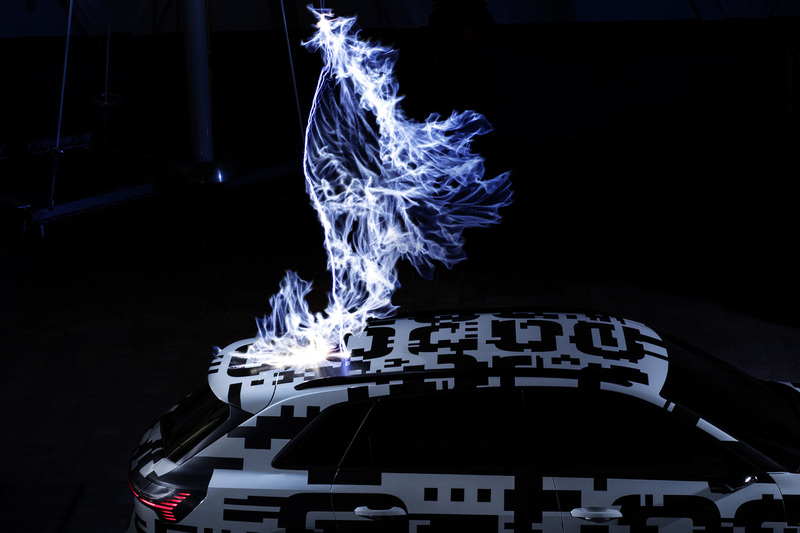 The experts have aimed a flashover voltage at the car. This experiment symbolizes something that people have been dreaming of for thousands of years: to capture lightning bolts and use their energy. Even today you can’t use a lightning bolt to charge an electric car, but the engineers have come a step closer to realizing the vision of lightning–fast charging. 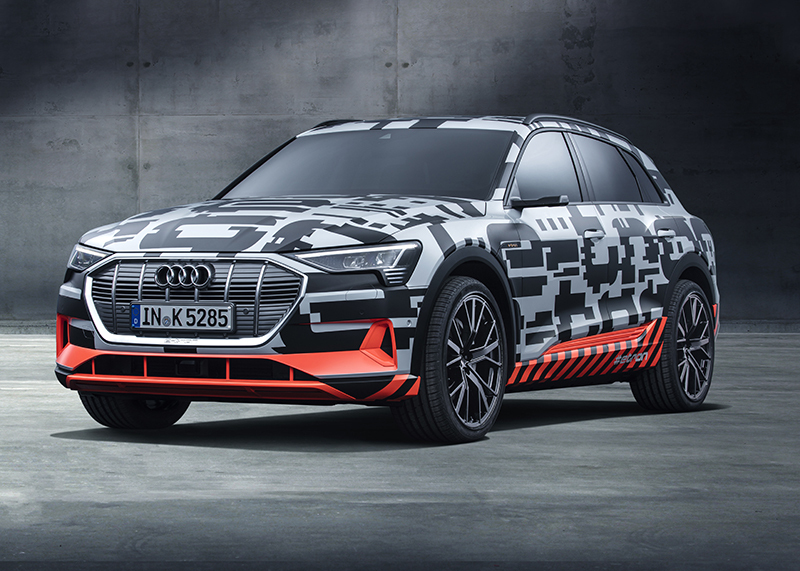 The production version of the Audi e-tron prototype is the first car on the market that can be charged with up to 150 kW. 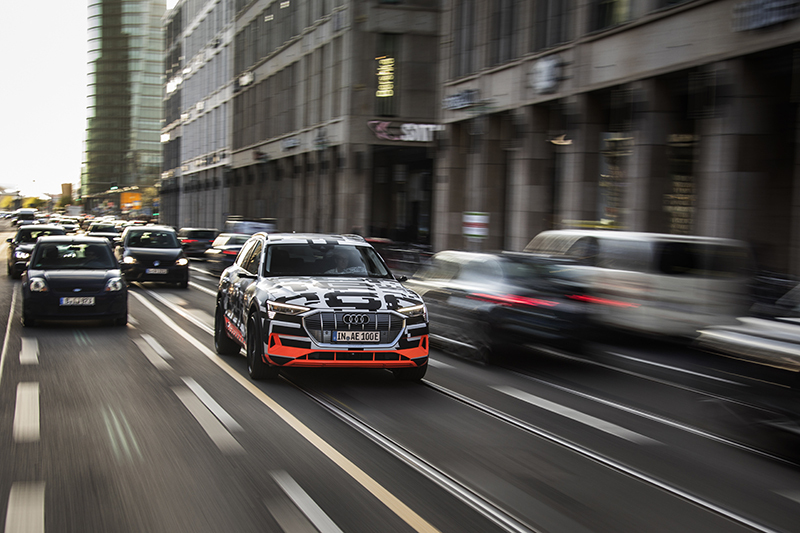 At high–power charging stations using the European charging standard Combined Charging System (CCS), such as those in the Ionity network, the Audi e–tron prototype is ready to set off on the next long–distance stage of its journey in less than 30 minutes. The key feature behind this is the sophisticated thermal management system for the lithium–ion battery. Located in the vehicle floor, it stores 95 kWh of energy to provide a range of over 400 kilometers (248.5 mi) in the realistic WLTP test cycle. The SUV offers full everyday usability. By the end of 2018, there will be nearly 200 of these high–power charging (HPC) stations with six charging points each. Plans call for 400 locations at intervals of 120 kilometers (74.6 mi) along highways and main transport routes by 2020. Audi offers various solutions for charging at home. If desired, an electrician referred by the local Audi dealer will check which charging options are available in the customer’s garage and install the corresponding technology. The standard mobile charging system can be used in two ways: with a charging power of up to 2.3 kW when connected to a 230 volt household outlet and with up to 11 kW when connected to a 400 volt three–phase outlet. In the latter case, the battery can be fully recharged in roughly 8.5 hours. 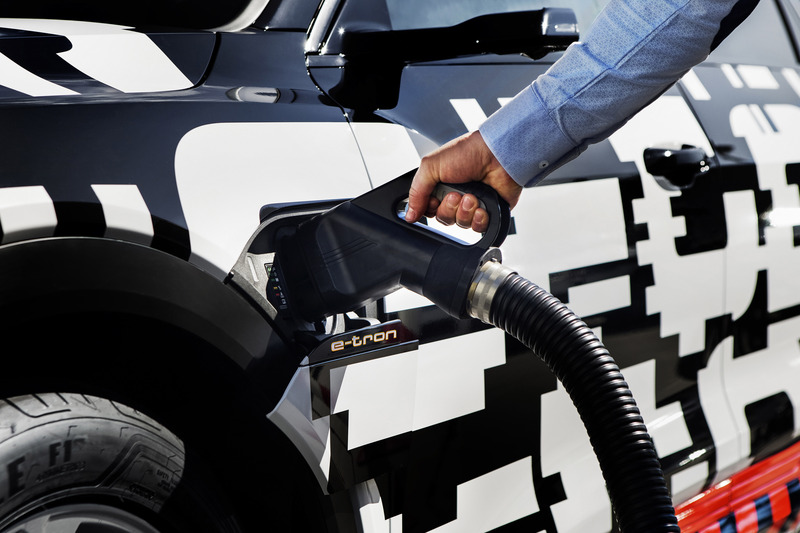 With the optional connect charging system, charging power doubles to 22 kW provided that the electric SUV is equipped with the required second charger. Together with a home energy management system, the connect charging system also offers intelligent charging functions. 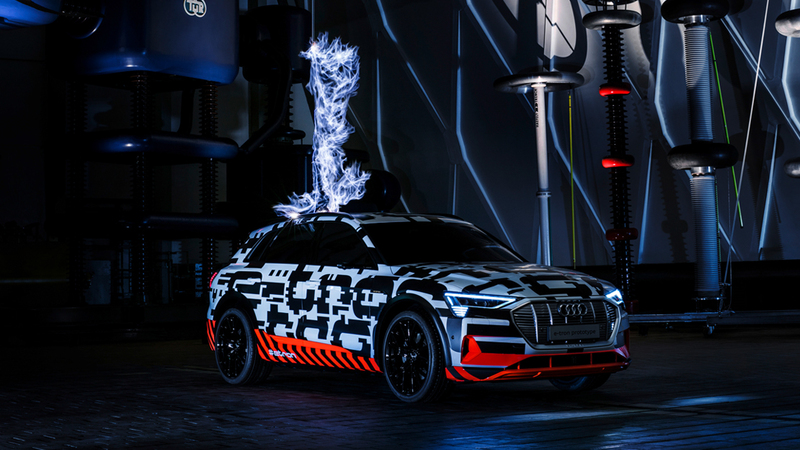 For example, the Audi e–tron prototype can charge with the maximum output possible permitted by the home electrical system and the car while also considering the demand of other consumers in the household. The myAudi app provides for convenient operation from the couch. It can be used to plan, control and monitor the charging and pre–heating/–cooling of the electric SUV. 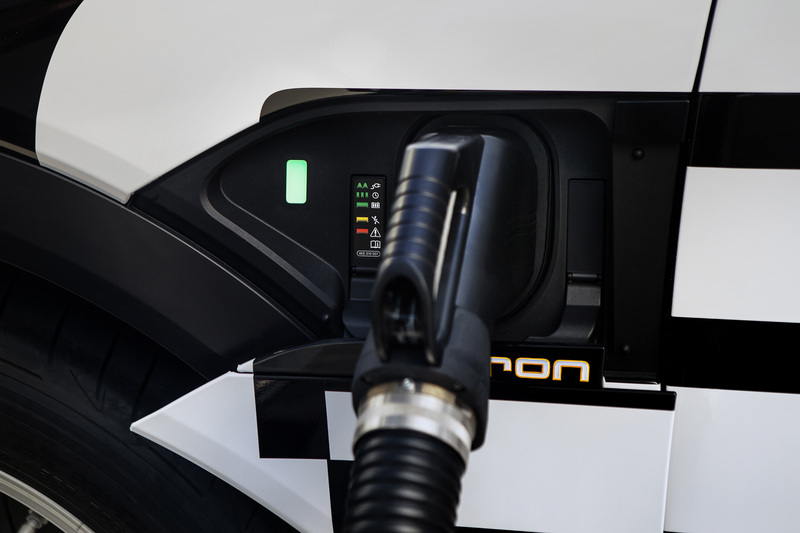 Customers can set a departure time, for example, so that the Audi e–tron prototype is charged and/or heated/cooled at the desired time. The app also displays charging and driving data.